SKU: LAB-NA-VB-v2. Category: CCNA Voice Lab Kits. 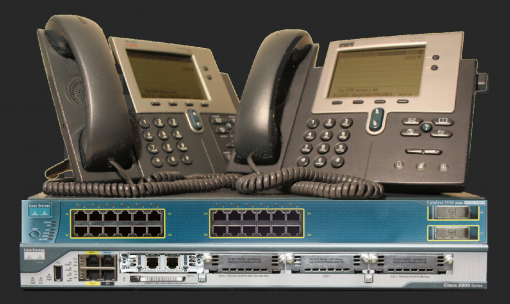 Are you are wanting to play with VoIP and do not want to spend a ton of money? Our CCNA Voice Basic Lab Kit has been designed to meet your needs. This Lab Kit is designed for you to be able to set up a VoIP phone system and make calls via the Internet using a SIP provider or via your PTSN (land line) phone service. 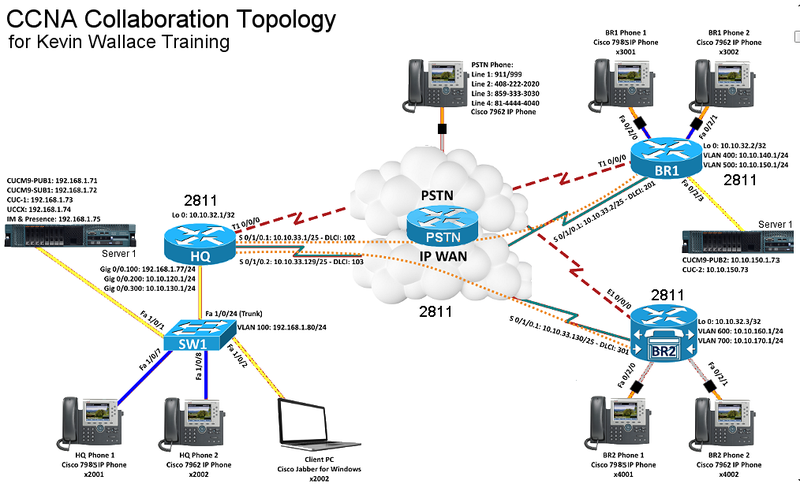 This Lab Kit is not a complete CCNA Voice/Collaboration Lab Kit although it is a great place to start for very little money! The second exam (210-265) tests your skills to implement various Cisco Video endpoints in converged Cisco video infrastructures. 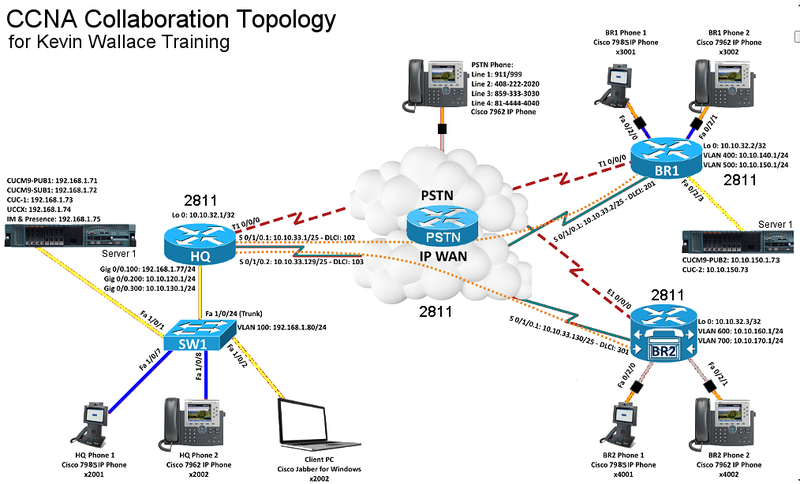 It also tests a candidate’s ability to implement and troubleshoot Cisco Unified Communication and Collaboration, TelePresence, and Digital Media Player in different Cisco business video solution architectures. However, this test does not need a lab to study for as most questions are on the equipment specifications, features, and very little on configuration or setup. But, if you want a pair of Cisco 9971 color video IP phones with camera to help you study the video side of the exam, we offer an add on option at Video Phones add-on. This is a BYOS Lab Kit, (Bring Your Own Server) to run the Cisco CUCM and other demo software. If you have a server with at least 12GB of RAM and 500GB of hard drive space, you can load VMware ESXi 6 (its FREE at https://my.vmware.com/en/web/vmware/evalcenter?p=free-esxi6) then install your Cisco Demo software and start learning. Another option is to purchase VMware Workstation and load it onto your PC to run the demo software. You may need to add more RAM to your PC depending on how much you currently have and what additional programs you wish to run at the same time. If you do not have a spare server or want to run the software on your PC, you can purchase one of our voice servers with everything pre-loaded on to it from us. See below for server options. 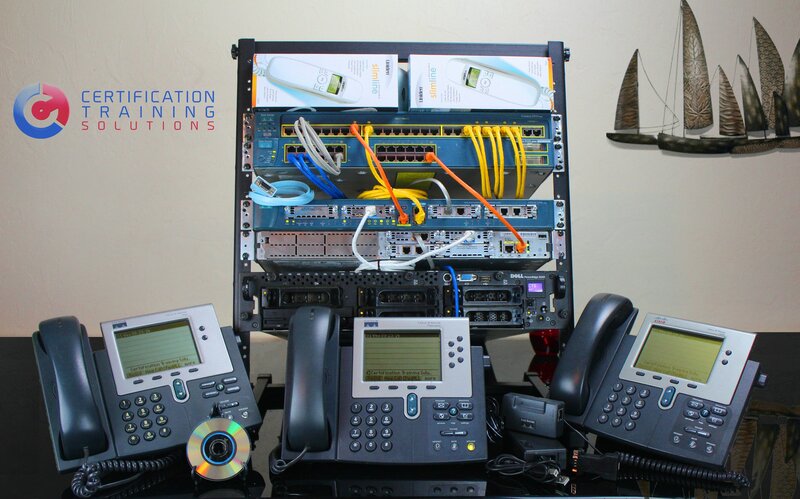 We include Brent Seiling’s CCNA Voice Lab Manual with this Lab Kit. Although this eBook is based on the old 640-641 exam, the basics are the same and he teaches you a lot of valuable information and lots of great labs to configure too. 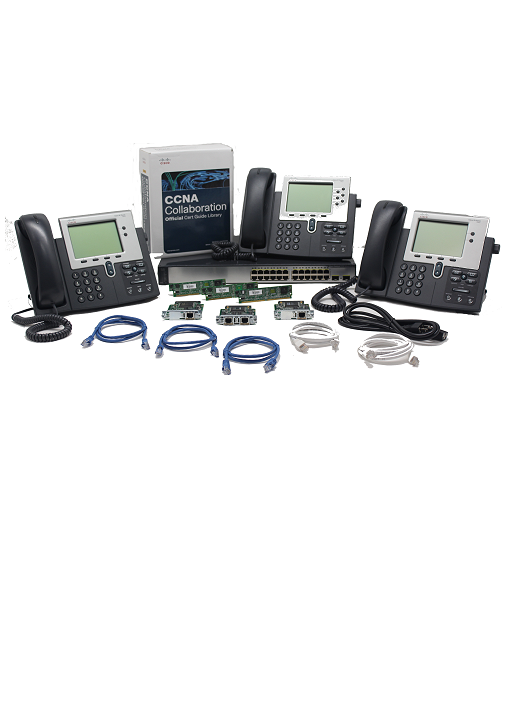 OPTIONALLY, we can offer you the Cisco Press CCNA Collaboration book set with labs that you can configure on your lab gear. The books have quizzes, test preparation guidelines, and practice questions. 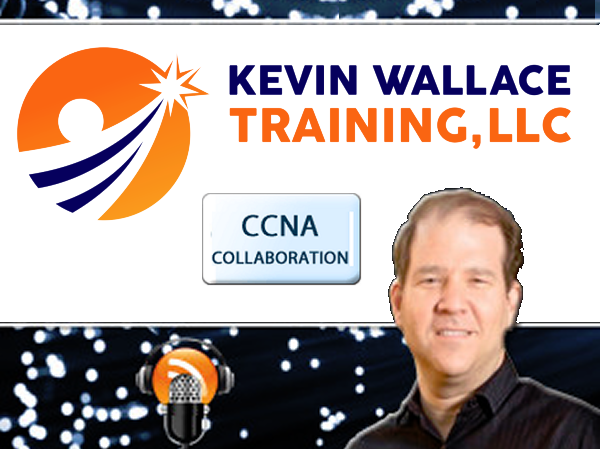 Or we can offer you a special discount on CCIE Kevin Wallace’s CCNA Collaboration course with the purchase of this Lab Kit. Check out his training for free at https://courses.kwallaceccie.com/users/checkout/auth. 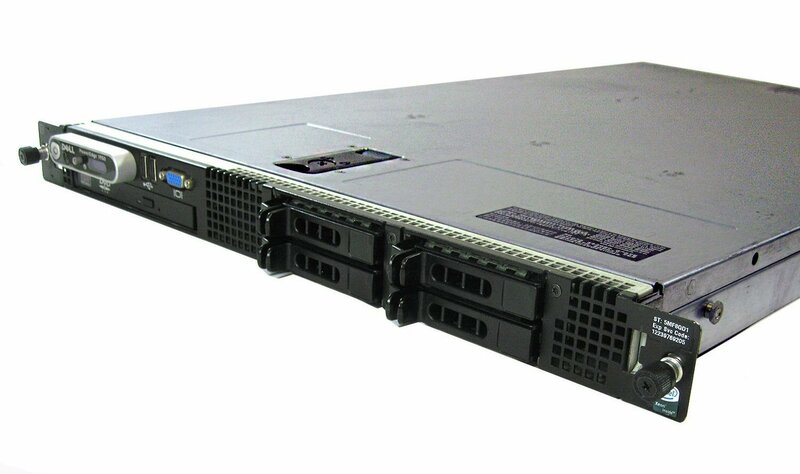 We start you off with a Cisco 2801 router with 256MB RAM and 128MB Flash RAM is loaded with the 15.1 IOS with full voice services, 2 Fast Ethernet ports, USB, console and AUX ports, 2 HWIC/WIC/VWIC/VIC 2 WIC/VWIC/VIC slots. CallManager Express 8.6 is loaded on the router for you to configure your VoIP system and learn. There is no need to have a power supply for each IP phone, a 3550 multi-layer Power over Ethernet switch (supporting true Layer 3 routing running 12.2(44)SE6 EMI IOS) is part of this lab kit too. To make calls you either need a SIP provider and/or a PSTN (standard telephone server) and with this lab kit you can do both! For a SIP provider to make calls over the Internet at a very low cost we recommend Anveo, this is who we use to run our business phones with. They have a $2/mo plan that is perfect for your collaboration lab kit. Check them out at https://www.anveo.com/account.asp? and use referral code 5352731. You can also connect your Lab Kit to the land-line phone system and make calls over the PSTN with the included FXO (Foreign Exchange Office) interface. Create complex dial-plans and route some calls over the Internet via your SIP provider and others out your PSTN connection. 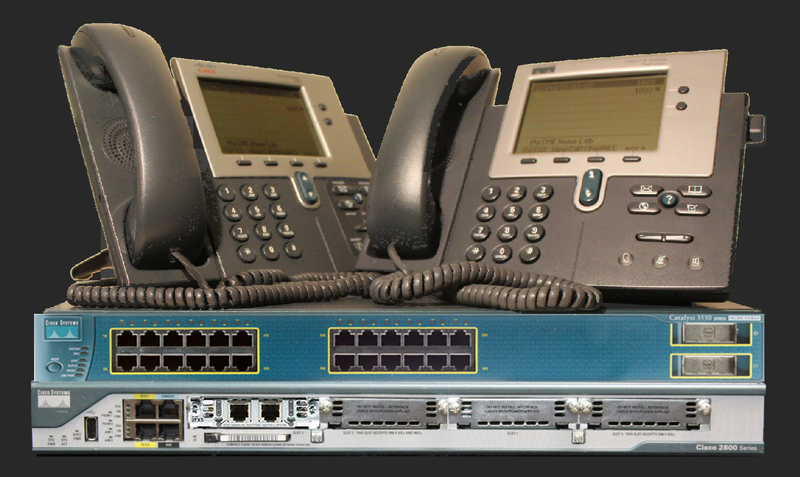 To place those calls we include two Cisco 7940 IP phones are part of the lab kit. These phones have two line buttons, a monochrome LCD screen, and support many CME and CUCM features. And your hard earned money is not wasted, as your needs grow, just add additional routers, switches, and modules to take your skills even further. 2801 Router; 100-240VAC auto-switching 1A average. 3550 PoE Switch; 100-240VAC auto-switching 5A average.